Unfortunately. 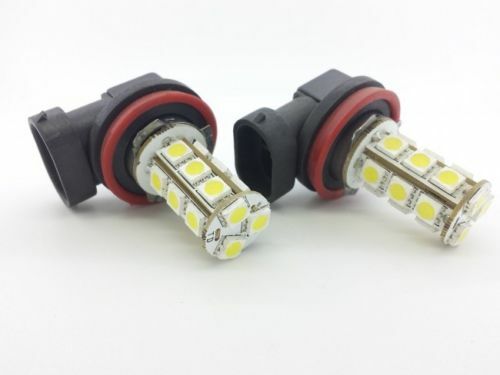 aftermarket LED headlight bulbs are just not there yet. As far as I know, nobody (even major manufacturers like Philips) make replacement bulbs that are DOT certified. With bulbs like these, you're just getting something for show. I wouldn't recommend using them as your primary headlights. hidplanet.com is my go to resource for aftermarket lighting. Spend some time there if you'd like to learn more about your options and the state of aftermarket lighting. dasrider and Mad Myche like this. H11 LED' are so cheap on ebay that I might buy 2 and see what they are like! As they are for my dip beam my concern is that the actual position of the LED' on the body of the bulb might not match the light pattern form the original filament bulb. As Obi-Wan once said; "your eyes can deceive you". Don't fall for the hype and pretty pictures that companies and sellers show. Yes, this. On ebay you're getting garbage Chinese product that hasn't been tested. They know it will turn on, and that's about it. At best you'll end up burning up your wiring. At worst, you could melt your headlight housing or end up with an assault charge when your misdirected light blinds some other driver and causes an accident. There is a reason people don't sell them except on ebay, and a reason why they are so cheap. If you want LED headlights, don't cut corners, buy an actual LED headlight housing kit. And if you decide to do it anyway, we all warned you. I agree with all posted by other members, I wouldn't use those for my head lights. I bought a couple of those for my fog lights, my 6 has HID's and I wanted to match the color. They do not last, after a couple of months they started flickering, it is like some of the LED's soldering fails due to vibration, 3 out of 4 bulbs did this. I just put my halogens back on. My SHO came with the expensive type of aftermarket LED's on the headlights. One of the ballasts failed within a month. I replaced them back to the OEM bulbs. It could just be me but I haven't come across a good, long lasting LED bulb, even for interior lights. Used them for all my LEDs in my '10 (front and rear turn signals, side markers, license plate, and reverse/back-up lighting), and only had one license plate lamp fail after 6+ years of use. I've also used them to swap out all the filament bulbs in the interior of my '18. Check them out here, starting at post 14. I'm a firm believer of "you get what you pay for", so yeah, they're expensive, but their quality is second to none, their light output is fantastic, and they stand behind their product. I've recently found a great website/youtube channel, they're called Headlight Revolution. They test hundreds of LED headlights and explain what to look for when buying LED bulbs. Go watch some youtube videos and you'll learn real quick in a hurry! No two light sources provide for this due to simple physics. The best that can be done is an approximation. Something many people don't realize is that cameras react to light and color differently than people do, what a camera captures is not the same as what you can see so pictures of a light pattern on a wall usually are nowhere near an accurate representation. Headlamp assemblies are not tested on something this simple, they use very expensive photometric testing devices to plot out a graph of light brightness and distribution.